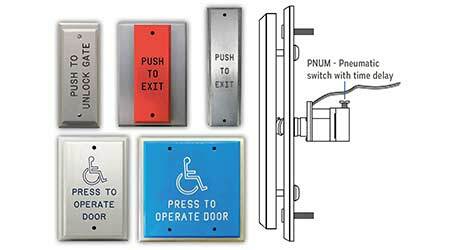 DeltrexUSA 106 Series Push Plates feature large push plates mounted on a back plate with smooth beveled edges and joined from the back with concealed screws. Marine type aluminum is standard, while also available in stainless steel and architectural bronze. Narrow recessed models specifically designed for storefront frames can be ordered, and both color and deep-cut engraving can be customized to specification.